March 2008 : the new Diff is broken, it's a narrow Bedford Petrol bus if you know of one being a chicken shed in Wales with a diff I would like it please as its my escape plan from Hatfield! 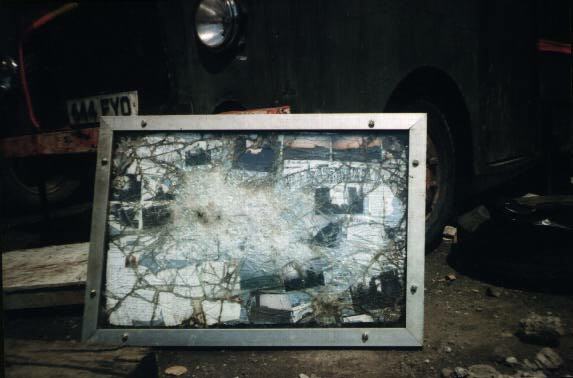 In June 1985 whilst driving towards Stonehenge Free Festival police smashed six windows , I got it back off them a week or two later and drove to Westbury White Horse for a night, then on to Pilton Festival Mud, and back to Greenlands for the summer. 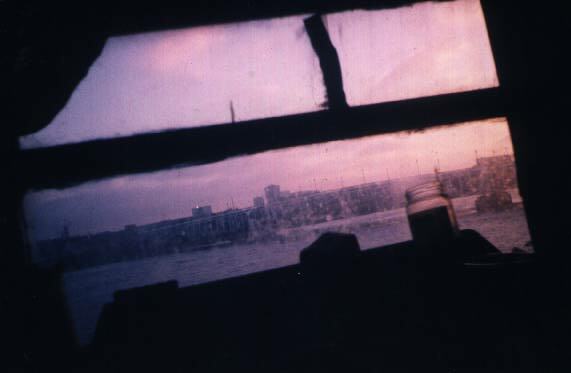 We were evicted in December; I drove it to London, Rotherhithe Street, South of the river) where it conked out. Years passed. At a squatted yard in Evesham Street, Shepherds Bush, I broke my arm with the starting handle kicked back. 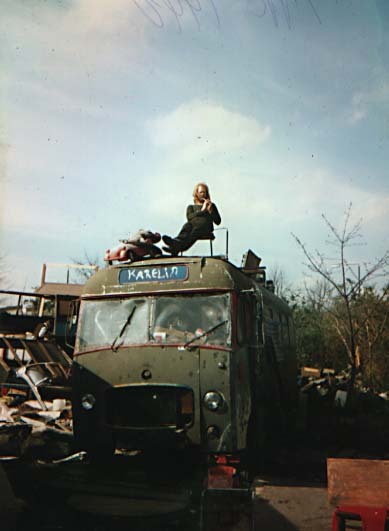 Later I took out the engine and replaced it with the old petrol engine out of the Travellers School Bus. 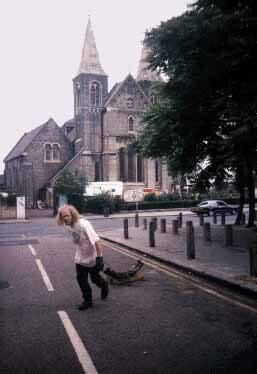 In 1995, when parked outside the Kentish Town Rainbow Centre (in a squatted church) the I took off the back springs, then took them a mile or so onto a blacksmith's to have them retempered. They kindly added a few new leaves. 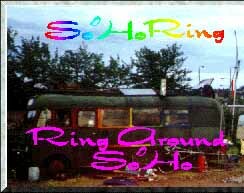 Summer 1996 I was at Wandsworth Eco Village these two picures I used as an icon for the geocities/soho ring in my ??? dicegeor.htm webpage. It's from there that I got this windmill. Now, January 1998, it's parked here at Dead Womans Bottom , near Nunney near Frome in Somerset. Sunday 4th January 1997 - 3.30pm, getting dark soon, when I started my bus yesterday or the day before (using the handle) it took quite a lot of turns, I drove it back about a yard, then it stalled, another ten minutes on the handle before it started again, I drove it back a foot, it stalled again, but now it's roughly where I want it, the front right wheel is a bit low, I was going to drive it onto two boards but no, perhaps I'll jack it up onto them, more serious is why it stalled. I decided it was a blockage in the carburettor. I disconnected the petrol pipe going into the carb, then, before disconnecting all those fiddly pipes I connected up the battery and turned on the electric petrol pump:- no petrol pissed out. I had a little think and realised it wasn't the carb's problem, it was back a bit. So I took the glass float off the bottom of the old Bedford mechanical petrol pump- there was petrol in it and it was clear, clean. I looked out for a volunteer- Ruth was walking by, "can you lend me a finger for two seconds?" I asked, "Well I'm just on my way to do something..." but had a minute. so I lay under the bus on a bit of board and she turned the electric petrol pump switch on, and then off, but again, no petrol pissed out. Later I found the stick I use as a petrol guage, opened the petrol cap, inserted the stick, As I'd just guessed there was no petrol. Turning the starter handle had worked the mechanical pump to get some petrol up from it to the carb, but there wasn't any drawing up from the tank. When I thought back to the journey here in August, it was a long ten miles, broke down three times, put in some petrol before Nunney Catch but I now remember that all my passengers managed to raise only about £2.00 between them. And then there were those hours as i tried to get the bus through the rocks, the first day failing, twice driving to the top of the hill and doing a U-turn, eventually coming in backwards; plus the move a month later when I came up here to the concrete. 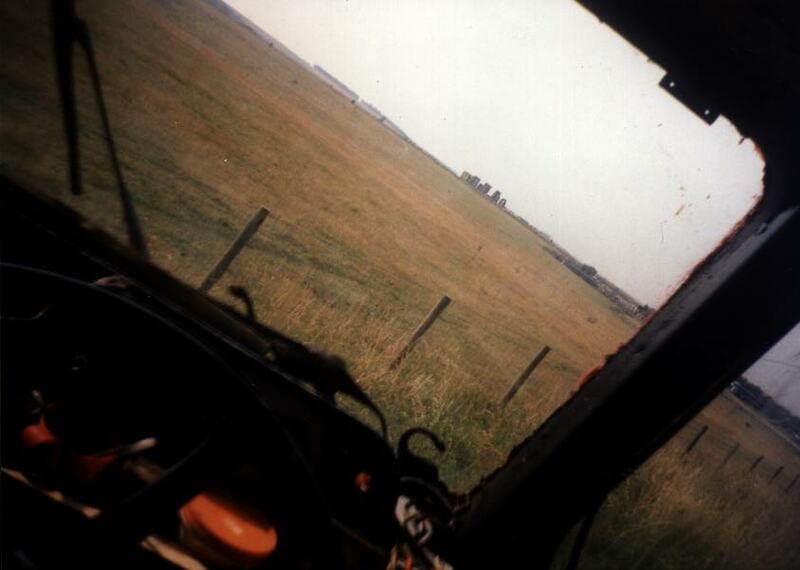 h23:26 fri22dec2000 : in my bus , on a slope in a layby near Warminster. Why? Well, lets start last Saturday when I took down the windmill and manoevoured the bus so it was pointing out the yard. Sunday lunchtime I tidied up and drove out, along the new Dead Womans Botom Quarry road to Frome Sainsburys. There I got money from the cashpoint and food and drink and petrol. Then onwards to the West Wilts industrial estate, Westbury. All went well, the battery got charged, it was still light when I got there. Did a few little electrical jobs, got moved on twice from a side road, settled in a main road, lit the fire, and slept. Monday went for the MOT, almost passed. First the brakes test, then over the pits he found the front right wheel wouldnt turn. I drove out, into a side road, wheel up onto the pavement, stopped. Loosened the wheelnuts, jacked up the wheel, started unloosening the wheelnuts when it turned - it had freed itself driving. Cycled to a spares shop to get a new wiper blade, they didnt have my type (the one I'd got off a dead car back window), but I made up a new one out of several old ones. It was getting dark, I started it on the handle, zoomed off the pavement, speedy three point turn then back to the MOT for a retest. A new clanking noise which I ignored. I jacked it up, showed that the wheel turned, showed off the wiper, it passed. Drove outside to the road. Did a few little jobs, made tea. Now it was dark. Drove up and down investigating the noise. Did it come from the gearbox? No, further back. Got underneath, had a look. An oil leak at the back of the diff. A hole in it. I drove the left wheels onto the pavement, put some wood down and drove the right wheels onto it. now the bus was up a bit, I got underneath with a torch. The hole seemed to come from the inside. 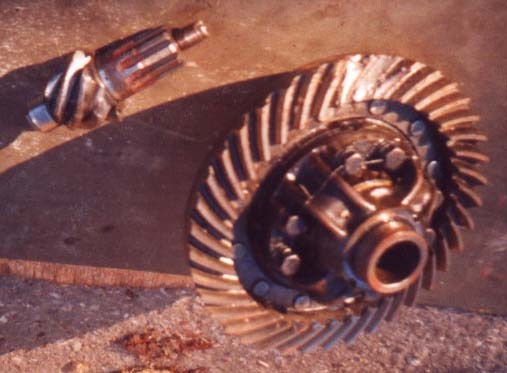 I unbolted the diff cover, drained the oil, there were bits of metal in with it, the gear wheel looked a bit chipped. Back into the bus, another cup of tea, looking at my photocopies of pages of Bedford manuals, and other mechanical type books. I'd never seen inside a diff before. The more I took it to bits the more I found wrong. Three teeth were broken off the Crown Wheel. A bearing was mangled. The pinion was mashed up. These were new words to me, I was learning. By 2 a.m. I knew I was in big trouble. I should have taken more time over it and drawn pictures of how the bits were as I took them out but I was in a hurry. Christmas was coming, if I ordered the bits and they were available (it's a 1963 bus) I maight have to wait until New Year - all the garages would shut soon. I'd have to stay alone in my bus in cruddy Westbury Industrial Estate and miss Stonehenge Solstice and Christmas and New Year plans. Because I have all my years of papers and tools and musical instruments and this laptop, and if I left the bus they could get stolen by some halfwit. So Tuesday I went to investigate getting a diff spares. They suggested I try the local scrap yard, I was pessimistic but they had two Bedford Diffs, one of which was almost identical to mine. I bought it for £100 and got it to bits just as it got dark. cycled back to my bus with the bits, made tea. That night I sat under a street lamp cleaning the bits, and trying to understand how a diff works. This was Tuesday night, Stonehenge Solstice was Wednesday night, Thursday morning. I put the bearing in, and almost got the Crown Wheel in, but I was shattered. Sleep. I got out the books and read them. They suggested the pinion could be too far forward, I should remove a shim. I got underneath and took off the prop shaft and the front cover. I could move the pinion back and forth about half an inch! Perhaps the nut needed tightening up. I tightened it a bit and drove back anbd forth in the layby. Horrible clankings. This was about half past ten at night. I decided not to drive to Stonehenge, I was exhausted, If I went for it and the diff disintegrated not only was it a waste of money but I'd be blocking a road with my camoflaged bus, liable to be towed away and impounded, and a danger to unsuspecting speeding motorists. My phone was out of range. I climbed up the bank and phoned various people, told them what had happened. Willy X said he'd come and get me. I left a phone message saying I was broken down in a layby outside of Warminster, that my phone was out of range, that I'd get to Stonehenge if I had to cycle there, but hopefully I'd get a lift. Though the thought of cycling along dangerous roads at night wasnt too brill. I lay down to rest, waiting for my lift. I was woken by a knocking at my door. It was Snakes and Annette and their new baby and Howie. They were passing and had seen my bus. It was Thursday morning, the shortest day of the year, I'd missed the Solstice sunrise. Loads of people were at Stonehenge, it was great. They gave me some water. They left. I got under the bus and pulled the front of the diff apart again, compared it with the books and the broken bits and the bits of the one from the scrap yard I hadnt used. They were all different. I decided the nut was loose. JJ, Elly and Wolfy came visiting, agreed with my diagnosis. They left, I drove back and forth, then tightened the nut. The pinion was still loose. I phoned up friends who'd been at Stonehenge - 'Why weren't you there?' they asked - 'Didnt Willy tell you I was broken down and waiting for him?' 'No - he was drunk - we'd have come and got you if we'd known..' Gosh I was cursing him as I toiled under my bus. My hate was getting a bit bad until I found a solution which made me laugh - Next time I'm at Stonehenge I'll ban him from my bus, or, if I fail to fix the bus and it gets towed away and impounded by the police and destroyed then whatever vehicle I do have. I phoned him and told him - he hadn't realised what he'd done by not coming and getting me or telling our mutual friends that I was broken down 15 miles away. With friends like mine who needs enemies? It was Thursday night. To sleep again. Friday, today, I took it all to bits. There's a tooth knocked out of the new Crown Wheel, and bits of metal in the oil. Drat. Looking at the bits I found a doughnut with damage, it must have been near the pinion when things went wrong, I'd put a narrower one there. Somehow in my haste I'd mixed them up. Normally I spend weeks doing new mechanical jobs, drawing diagrams at every stage, stopping and thinking and sleeping on it. But this time I'd been racing against the clock. So I rebuilt it with the wider doughnuts, and it seems a lot better. I did the gaskets and filled it with oil, about 10pm I was ready to try again but I noticed oil dripping out. And I've run out of gasket goo. I drove it back and forth, it's a lot better but there's still a little clanking - where I knocked a new tooth out of the Crown Wheel driving from Westbury to Warminster I think. But because oil's dripping out and there's nowhere to buy gasket goo I drove it back up onto the pavement and put a bowl under the drip. Tomorrow I'll either cycle to Warminster to get gasket goo, or if it hasnt lost too much oil risk it and try to drive back to site. But its quite a way, and there are no garages or laybys on the route. And tomorrow is Saturday 23rd December, aargh! On Saturday not much oil had dripped out, I started it on the handle and drove it back home to Somerset at 10mph, clanking all the way.